What if I told you there was a magical ingredient that you could add to your aquarium filter? … A magical ingredient capable of removing chlorine, water discoloration and even bad smells from your aquarium. And today, I am going to teach you everything you need to know about it. What is activated carbon, and what does it do? What can’t activated carbon do? What are the different types of activated carbon, and which is right for your aquarium? Which is the best activated carbon for your filter? 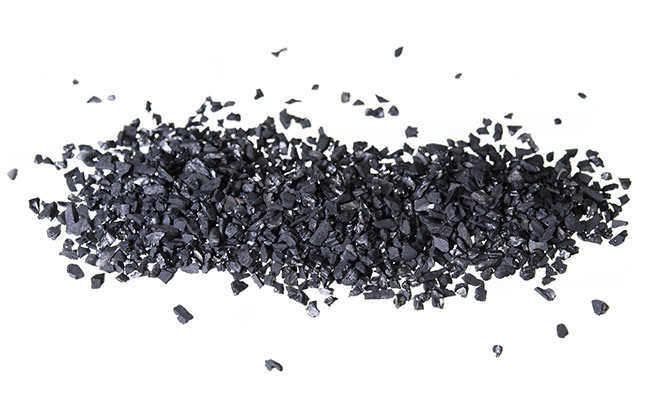 Activated carbon is essentially charcoal. That’s why you might hear it referred to as activated charcoal. Each piece of charcoal has been specifically manufactured so that it contains hundreds of tiny pores. To put it very simply, these pores trap pollutants, making activated carbon excel as a chemical filter media. You should already be using a good water conditioner for freshwater tanks or reverse osmosis (RO) water for saltwater tanks to remove chlorine or chloramines during water changes. But where activated carbon really shines is clearing up your water and removing bad smells from your aquarium. Activated carbon is so popular that most modern filters actually ship with a carbon filter already installed. Those that don’t have made room for you to add it yourself, if you choose. You should know that once the pores in the activated carbon fill up, it can no longer trap any more of these pollutants from your aquarium. Because of this, you need to replace the activated carbon in your filter. I often do it during my regular maintenance routine. Fortunately, activated carbon is cheap and replacing it can be done in seconds. Well, that answer entirely depends on how dirty your water is. The dirtier the water, the sooner you need to replace it. For a well-maintained aquarium, many fish keepers replace the activated carbon in their filter once each month. To ensure the activated carbon in your filter lasts as long as possible, it should be placed after your mechanical filter. If you install the activated carbon before the mechanical filter, it will soon become clogged by the larger debris. Oh, and don’t worry – activated carbon won’t leach any of the pollutants back into your water once it is full. While it is technically possible for activated carbon to release the pollutants, this would require some changes to the water chemistry that simple will not occur in your aquarium. So, don’t worry if you forget to remove the carbon from your filter – it won’t harm your aquarium. Activated carbon is perfectly safe. 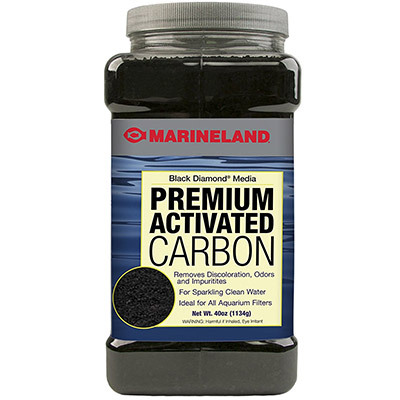 Activated carbon is often praised as this miracle product that will save your tank from any problems that may occur. I hate to break it to you, but it isn’t true. … You know, all the stuff involved in the nitrogen cycle. Water changes and other methods must be used to remove these toxins. 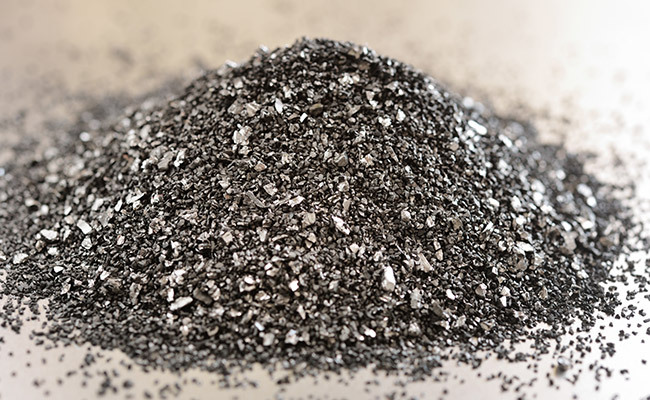 Activated carbon also won’t remove heavy metals, such as iron. If your water source contains these, use a water conditioner before adding the water to your aquarium. And of course, you cannot “recharge” or “reactivate” activated carbon. I have heard so many stories about how you can put activated charcoal in your oven to restore it to as good as new… Don’t waste your time! You cannot rinse them either. Once the pores on your activated carbon are full of trapped pollutants, it’s only suitable for the trash. I would also like to add that if you don’t keep your tank clean and perform regular maintenance, all the carbon in the world is not going to save your tank! What are the different types of activated carbon, and which is right for you? 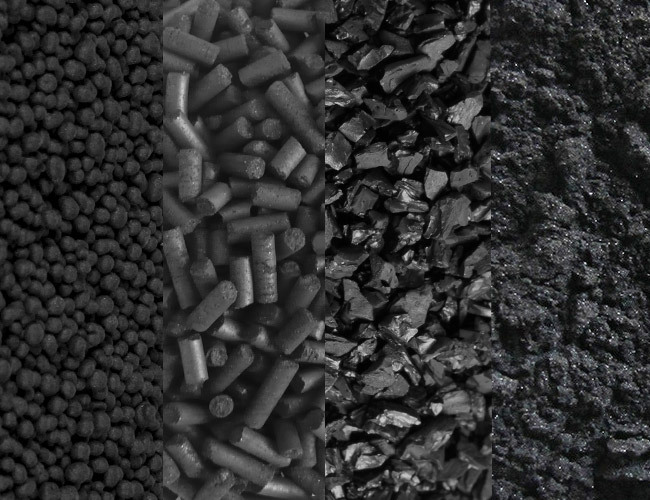 Be mindful that activated carbon comes in a wide variety of shapes, depending on how it is manufactured. And, each has a specific use. In aquariums, you want to use Granular Activated Carbon. In aquariums, you want to use an activated carbon made from Bituminous coal. So, to clarify, when shopping for activated carbon for your aquarium filter, you want Granular Activated Carbon made from Bituminous coal. Why do you want this type of activated carbon over the others? 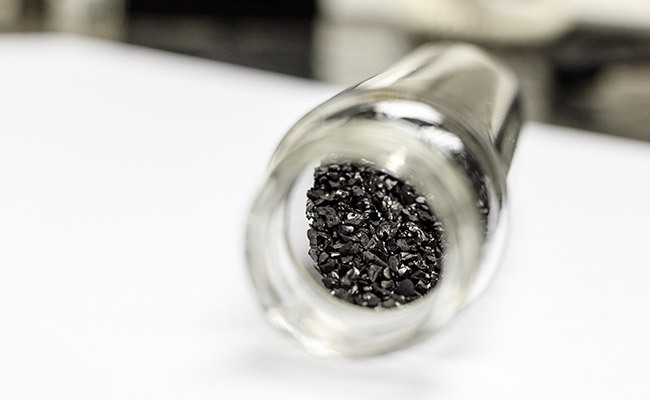 Well, this activated carbon has a superior pore structure for removing pollutants from water and is specifically designed for water treatment. In fact, if you have a water filter for your drinking water, chances are it contains Granular Activated Carbon made from Bituminous coal. Don’t settle for anything less! And I mean it. I constantly see carbon pellets and carbon beads sold at pet stores as aquarium filter media made from all different materials. Don’t be suckered in by their cheaper price – they are the wrong tool for the job. Other types of carbon not only remove less pollutants but can also clog quicker. One more thing before I move on – be mindful that some types of activated carbon contain phosphates. If your carbon filter contains phosphate, then it can actually leach into your aquarium. And you don’t want that… Especially if you have a freshwater tank. Many types of algae love phosphates, and elevated phosphate levels often lead to algae taking over your entire tank. If your test kit reveals that your tank is high in phosphates and you can’t find any other reason for the elevated phosphate levels, try removing your carbon filter – it could be the culprit. If you bought a brand name filter, chances are that the manufacturer also provided a carbon filter to fit. The problem is that these filters often use inferior activated carbon and are expensive. However, I have a better solution. And, it’s going to save you money! Okay, that’s step one done. But you can’t add it to your filter like this – the fine grains of carbon will blow around your aquarium. Next, you need to grab a reusable media bag. These things are awesome! Fine mesh is best. Like these ones – make sure you choose the right size for your filter! Fill your media bag with activated carbon and place it in your media. The bag not only holds the carbon in place but also makes it easy to remove! Don’t forget to rinse any carbon filter before adding it to your aquarium. The small pieces rub together during transport, creating dust. You don’t want black dust floating around your aquarium, do you? A quick rinse under tap water is all it takes to remove the majority of dust. Remember how I told you that activated carbon can’t remove ammonia from your aquarium? Well, if you blend it with zeolite, it can! 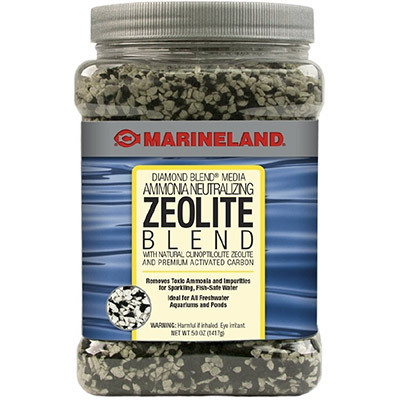 Zeolite absorbs ammonia like a champ, and when combined with activated carbon, you get the benefits of both media in a single package. So, you have a sick fish. No problem, add some medication to your tank, and your little pet will be better in no time – right? You see, activated carbon actually absorbs many different medications, preventing them from benefiting your fish. If you plan to medicate your fish, remove all traces of activated carbon from your tank. Once the treatment is over, return the activated carbon to remove any leftover medication from the water. Do you use activated carbon in your filter? Let me know in the comments below! I bought activated charcoal from online store. I have drained it repeatedly but it still gives out sligh black colored water. Is it safe to be used in cannister filter? It’s possibly safe to use, but if it is still giving off small dusty particles then you risk staining your water a darker color, until these tiny particles are filtered out. Hi! I’m fairly new to the saltwater hobby. I’ve been trying to learn everything I can about the chemistry of it for water quality and everything else there is to learn about keeping a healthy reef tank. Unfortunately everything I read or watch is so confusing. I’ve just read a couple of your articles here and I love how you break it down so simply!! I learn better if I know the “whys” about things and you seem to do that in your articles. My question is have you done a fish tank 101 article for people like myself that know nothing about this? If not, have you thought about it? Thanks for the lovely feedback. I’m glad you have found these articles helpful. Great minds think alike! I’m actually in the process of writing a giiiiiant article on how to set up a fish tank covering every single step of the process, including choosing tank size, products, cycling, chemistry, maintenance etc. Unfortunately, since this site is a hobby and life keeps getting in the way, it’s taking considerably longer than I anticipated. 1. I just used carbon media (EAC) and I put it in my external hanging filter and do changing all the water.But the water turned yellowish .I scared if the carbon will harm my fish.I don’t use and treatment medication just added some water conditioner and aquarium salt (to kill bacteria).Can you tell me what happens? 2. Can I use a thing seller recommend me to use (like a yellow wet powder) to clear the water back.I usually use andit works before .That time I don’t use carbon filter yet. 1. Activated carbon shouldn’t turn your water yellow. If you can trace it to that, then it’s possible it hasn’t been processed properly or something else was mixed into it. Adding carbon shouldn’t change the color of your water. 2. Living in the US, I am unfamiliar with these products. It would depend on what the yellow is. If it’s dust or sediment, it will need to be filtered out. If it’s algae, you’ll need a different solution. If it’s something else, then you’ll need another solution again. 2. Yah sorry I know what this seller recommend me.It’s alum to crystal clear the water back.Can I use while using carbon media? Unfortunately, I can’t help you here. I have no experience with the products you are using. Is there a local fish club or fish forum you can ask? I am thinking of adding Activated Charcoal in my aquarium filter system, but the only space available for the Carbon is inside my UV light Chamber. Will the UV light damper or affect the performance of the Activated Carbon? Any water that passes through the charcoal will be shadowed from UV light, meaning that it will not be treated. Otherwise, I understand that many air purifiers use the both of these together so it may be a possible solution if UV treatment is not important to you. Your iron levels sound extreme for them to be coloring the water. Activated carbon will not help here, you will need to use a water softener. I’d be hesitant to use this water at all as it may contain additional contaminants that will harm fish. It works! My driftwood kept turning my tank brown. Looked yucky. With magic carbon in my filter, my water is always crystal clear. Thanks for your comment! Activated carbon does work great at clearing up tannins (the cause of your brown water) Did you know you can also boil driftwood before adding it to your tank. It reduces the amount of tannins it gives of! I have bought few drift wood pieces from fish store which have been stored for last six months and they have white fungus. What should i do before placing them in my aquarium. I have read about boiling driftwood and bogwood. How about leaving them in low concentrated bleach water for some days and then let them sun dry. Any suggestion from your side is appreciated. Boiling should work, but if that’s not an option, scrape as much of the fungus off as you can and soak it in a bleach solution. I’d then soak it in fresh water so that the bleach doesn’t leak into your tank. You’ll likely want to soak it anyway since your driftwood will float if it’s not waterlogged.